Today, November 6, we celebrate the feast day of Saint Leonard of Noblac (died 559), patron saint of prisoners and women in labor. Saint Leonard, born of noble parents, served the Lord through serving those in power, eventually withdrawing to hermitude and working countless miracles on behalf of those in need. Saint Leonard was born to noble and illustrious parents in Gaul (now France), in the castle of Vendome in Orleans. Born into Frankish royalty, he belonged to the court of King Clovis, and his relatives were dignitaries, military commanders, and people of both privilege and society. Leonard was baptized by future Saint Remigius, and the King, himself, stood as sponsor for him. While he was still very young, the kingdom was threatened by an invading army. The Queen, knowing of Leonard’s Christian faith, jokingly suggested to Leonard that he invoke the help of his God to repel an invading repeal the attack. Leonard prayed, the tide of battle turned, and the armies of Gaul were victorious. Saint Remigius used this miracle to convert the King and thousands of followers to Christianity. From an early age, Leonard was destined for the service of the Lord. As he matured, he was so moved by the holy examples of Saint Remigius, Archbishop of Rheims that he renounced the world in order to lead a more perfect life. Looking to Saint Remigius for advice and spiritual guidance, Leonard quickly came to embrace and exemplify the greatest of Christian virtues, and while still a young man, took the tonsure (monk’s haircut) as a symbol to the world of his commitment to serving the Lord. His first calling was in service to prisoners, who he showed great charity, and worked miracles of freedom. Previously, King Clovis, in response to a prayer of Saint Remi, had issued an edict that prisoners in Rheims might be freed whenever his royal highness would pass through that city. Leonard asked the kind monarch to grant him personally the right to liberate prisoners whom he would find worthy of it, any time at all. Based upon his exemplary life, prudence, and good judgment (despite a young age), the king naturally agreed. Leonard earned himself a reputation of goodness, piety, and sancity, and soon all in the kingdom knew of him. He became a person of pilgrimage, with the sick and poor traveling great distances for his healing and charity. To each, he devoted himself, not only taking care of their physical needs, but teaching them the virtues of patience and love, and instructing them in the ways of sound doctrine. The king, so pleased with the reputation the holy man was earning for the court, desired to attach him permanently into his service, but Leonard, ever humble, replied that he preferred to live in humility and obscurity, as Christ had chosen for Himself for so many years. With the king’s permission, Leonard retired to a monastery in Orleans. Saint Maximin, the abbot of the monastery, saw to it that Leonard was soon ordained a deacon, which office he accepted out of obedience. However, Leonard did not aspire to any additional ecclesiastical dignities. Rather, he desired a life of austerity, sanctification, and preaching—the latter task taking him from the monastery to the pagans of the province of Limoges. On his evangelical journeys, Leonard discovered a nearby mountain, heavily forested, and rich in solitude. There he built a cell from the fallen branches of trees, and remained for some time, taking great pleasure in the provisions of the Lord. Leonard lived on herbs, wild fruits, and spring water, relying solely on the Lord to provide. He spent his days in communion with God, devoting himself to prayer, meditation, and physical mortification. 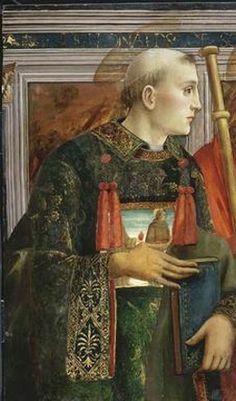 Saint Leonard fell ill while traveling, and as the end of his time on earth grew near, he miraculously had himself transported back to the Oratory of Our Lady, where he died. Numerous miracles of healing and freedom continued to occur, and he remains a popular saint of intercession throughout France and Europe. After his death, churches and monasteries were widely dedicated to him throughout Europe, including in France, England, Belgium, Spain, Italy, Switzerland, Germany, Bohemia, Poland, and many other countries. Pilgrims continued to travel long distances to his tomb, and over 4,000 miraculous favors have been recorded at his intercession. O Almighty God, who hast called us to faith in thee, and bast compassed us about with so great a cloud of witnesses; Grant that we, encouraged by the good examples of thy Saints, and especially of thy servant Leonard, may persevere in running the race that is set before us, until at length, through thy mercy, we with them attain to thine eternal joy; through him who is the author and finisher of our faith, thy Son Jesus Christ our Lord. Amen.